The Amy Gillett Foundation said Australia’s bike riders had united in their call to improve safety, with Andrew Nikolic MP today submitting the national a metre matters petition to the Australian Government. 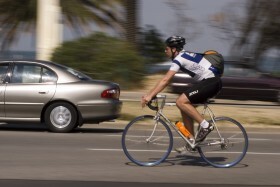 Tracey Gaudry, Chief Executive Officer of the Amy Gillett Foundation said the a metre matters petition, initiated by Cycling Tasmania, calls for improvements to the model Australian Road Rules to mandate a minimum overtaking distance of one metre when drivers pass bike riders on the road. “The a metre matters petition is a demonstration of unity that bike riding is great for all Australians and that improved safety on our roads is fundamental to growing cycling,” said Ms Gaudry. Launched at the 2014 Cycling Australia Road National Championships, the petition was supported by individuals, cycling groups, businesses and organisations and championed by three of Australia’s most well respected professional cyclists – Richie Porte, Cadel Evans and Anna Meares. “The AGF applauds Andrew Nikolic MP, Cycling Tasmania, and Richie Porte, Cadel Evans and Anna Meares alongside nearly 30,000 Australians who signed the petition for their support in delivering this important message to the Australian Government,” said Ms Gaudry. “The a metre matters petition, and the support it has been given, shows that safety when riding in an issue shared by every Australian bike rider,” concluded Mr Burns.